Which prep school alumni teams do you want to see compete in TBT 2019? Some of the best up-and-coming players in the world will be on display this weekend at the Basketball Hall of Fame Hoophall Classic. 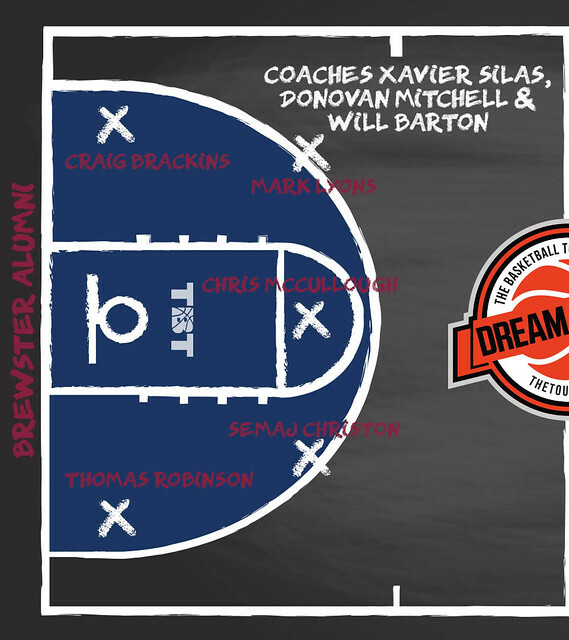 As prep school basketball fans are well aware of, two of the most notable teams lacing 'em up are Brewster Academy (Wolfeboro, NH) and Oak Hill Academy (Mouth of Wilson, VA). Whether it be NCAA Tournament heroes, EuroLeague greats, or even NBA All-Stars, these two programs have produced countless notable names over the years. In that spirit, let's take a look at the teams they could put together for TBT 2019! G - Mark Lyons: He only played one season up in Wolfeboro, but Mark Lyons is a no-brainer addition to a Brewster alumni squad. In three seasons at Xavier (2009-2012), Lyons twice led the team to the Sweet 16 and scored just under 1,200 career points. He then transferred to Arizona for his senior season and led the Wildcats in points (14.9) and assists (2.97) per game. Predictably, Lyons has had a storied professional career, most notably winning the Israeli League scoring title in 2015 and 2017. G - Semaj Christon: Are we sure this isn't an Xavier alumni team? Similar to Lyons, Semaj Christon put up ridiculous numbers as a member of the Musketeers from 2012-2014. How good was he? Glad you asked. In addition to leading Xavier in scoring and steals in each of his two seasons, Christon is just one of two players in program history to reach 1,000 points as a sophomore. Talk about impressive. In addition to a stint with the Oklahoma City Thunder, Christon has since played in the G-League, Italy, China, Puerto Rico, and Israel. F - Thomas Robinson: The simple fact is that experience matters in TBT. Along with an unreal skill set, that's exactly what Thomas Robinson brings to the table. The Kansas product helped coach Team FOE to the Super 16 in 2016 and Northeast Regional Championship Game in 2017. Pair that knowledge of the event with his 324 career NBA games and Robinson could be a serious x-factor in TBT 2019. F - Craig Brackins: Every college basketball fan knows that Craig Brackins belongs on a TBT roster. If you need a refresher on why, just rewatch the tape of his insane 42-point, 14-rebound outburst against Kansas in 2009. With that being said, that's not the only reason Brackins is destined to play in TBT. For the past two seasons, the Iowa State product has played alongside Overseas Elite star Justin Burrell in Japan for the Nagoya Diamond Dolphins. At this point, he's almost certainly heard countless stories about what it takes to win in TBT. C - Chris McCullough: He grew up in New York, played college ball for Syracuse, and was drafted by the Brooklyn Nets. Even though Chris McCullough sounds like a perfect fit for Boeheim's Army, the love that he has for his Brewster family is unmatched. After spending the last three seasons bouncing between the NBA and G-League, the 6-foot-11 big man is currently in China suiting up for the Shanxi Brave Dragons. He's averaging 15.7 points, and 8 rebounds per game. Coaches - Xavier Silas, Donovan Mitchell, & Will Barton: After coming agonizingly close to a TBT championship as a member of City Of Gods in 2015 and 2016, Xavier Silas brings a level of hunger and experience that can't be matched. While he could certainly handle the coaching duties on his own, if you add Utah Jazz star Donovan Mitchell and Denver Nuggets guard Will Barton to the mix, it has the potential to be one of the best coaching trios in TBT history. G - Brandon Jennings: He was the No. 1 prospect in the country in high school, he took the NBA by storm, and he's a streetball legend. Based on the looks of it, the only thing that Jennings hasn't done at this point is compete in TBT. If he plays anything like he did while at Oak Hill, this squad is in for a deep run. As a senior, Jennings averaged 35.5 (!!!) points per game and scored an unfathomable 1,312 points. To put that in context, the vast majority of high school players don't score 1,300+ points over the course of four years. Jennings did it in one. PLEASE get this man in TBT! G - Jordan Adams: Even though he hasn't played professionally since 2016, Jordan Adams proved he can ball with anyone in the world last summer. In three games for Sons of Westwood, Adams averaged a team-high 22.3 points and 6 rebounds per game. While at Oak Hill, Adams became just the ninth player in program history to score 1,000 points. He then went on to play two years at UCLA, earning First-team All-Pac-12 honors in 2014. Adams was drafted 22nd overall by the Grizzlies in 2014 and appeared in 32 games over the course of two seasons. F - Keith Horsnby: Does this name look familiar? Well, that's because we recently speculated that Hornsby could lace 'em up with an LSU alumni team this summer. The same goes for an Oak Hill squad. As a senior in 2011, Hornsby averaged 11.4 points and shot a deadly 50.4 percent from downtown. He went on to play two seasons for UNC Asheville before transferring to LSU in 2014. During his senior season, Hornsby teamed up with Ben Simmons to form one of the best backcourts in the country before suffering a season-ending abdominal injury in February. He is currently in his third season with the G-League's Texas Legends. F - Josh Smith: Just the possibility of seeing Jennings toss alley-oops to 2005 NBA Dunk Contest champ Josh Smith is something that we can all get behind. Oh yeah, he's also one of the best shot blockers in the world. When he was just 21, Smith became the youngest player in NBA to history to record 500 career blocked shots. Fittingly, less than three years later, he also became the youngest player in NBA history to reach 1,000 career blocked shots. Although he hasn't played professionally since 2017, the 33-year old Smith brings nearly 1,000 games of NBA experience between the Hawks, Pistons, Rockets, Clippers, and Pelicans. C - A.J. Hammons: Speaking of great defensive players, A.J. Hammons is undeniably among the best. In his senior season at Oak Hill, the 7-footer averaged an insane 4 blocks per game. That defensive mentality carried over to his college days at Purdue, where Hammons was a three-time Big Ten All-Defensive Team selection and was named 2016 Big Ten Defensive Player of the Year. He is currently balling for the G-League's Sioux Falls Skyforce. Coach - Rajon Rondo: TBT and Rajon Rondo are a match made in heaven. Not only is he universally regarded as one of the smartest basketball minds in the game, but he has openly expressed interest in coaching one day. 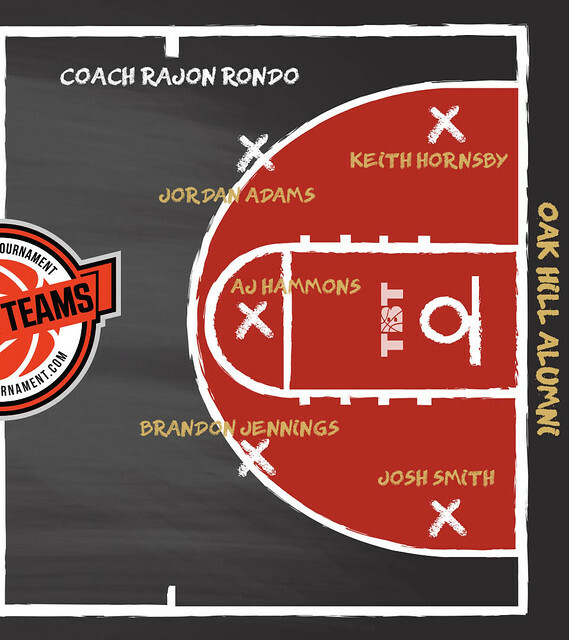 Why not begin that journey with a group of guys from his beloved Oak Hill?